It’s prompted countless movies, TV shows and Christmas pantos and now the famous story featuring the little girl and the big bad wolf gets the NetEnt treatment. 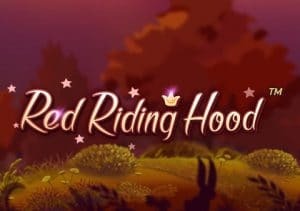 Fairytale Legends Red Riding Hood is a feature heavy, 5 reel, 20 payline adaptation that comes with cash trails, free spins and plenty of other tasty goodies. Play from between 20p and £200 per spin. The setting for this video slot is an enchanted forest and it’s fair to say that there are plenty of magical treats hidden about the place. First up is the Sticky Wild Re-Spin feature – this is triggered by landing 2 or more wild symbols on reels 2, 3 and 4 on the same spin. Those wilds will then be locked in position for the re-spin that follows. Add more wilds to the combination and you’ll receive another re-spin. Fairy Magic Spin feature – a cluster between 5 and 9 overlay symbols are added to the reels for 1 spin, making it that much easier to create a potentially monster combination. Fairy Surprise feature – following a winless spin, 1 standard symbol is chosen at random. The lowest value symbols will transform into the randomly chosen symbol in succession until a winning combo is formed. Fairy Wild Spin feature – during a randomly chosen spin, 3 or 4 symbols are added to the reels. A normal payout is made followed by a re-spin where the added wilds are locked in position. Coin Prize feature – this does exactly what it says on the tin, awarding you a cash bonus of 15 times your stake. Free Spins feature – this is also self-explanatory. You’ll be given 10 free spins but can get a further 10 more taking your total to 20. The Sticky Wild Re-Spins feature applies here giving you sticky wilds and free re-spins to boost your winning potential. Beware the Wolf Bonus feature – this one is a variation on the cash trail. Move along the board, picking up bonuses as you go. The further you progress, the larger the potential cash awards to be won with up to 200 times your stake up for grabs. As we’ve come to expect from NetEnt, Fairytale Legends: Red Riding Hood is a well-designed video slot. It may not quite have the visual flourishes of some games in the developer’s portfolio but it’s still very easy on the eye. Set against a forest backdrop and purple sky the reels include playing cards and a selection of books, roses, keys and locks, crown emblems and the FL logo which is the most lucrative of the standard symbols, awarding payouts of up to 400 coins. Red Riding Hood is the wild. The children’s story theme will be an acquired taste for some. If you like plenty of variety in your play, then Fairytale Legends: Red Riding Hood should fit the bill rather nicely though. Avoid the clutches of the big bad wolf and there could be goodies lurking in Red Riding Hood’s basket. I also recommend you take a look at Quickspin’s Big Bad Wolf which has a very similar theme.